Majesty, refinement and beautifully balanced proportions: the Imperiale watch is one of the great Chopard classics. For Christmas, the power of its sculptural lines radiates the glow and softness of new pastel colours and the soft shimmer of a mother-of-pearl dial. 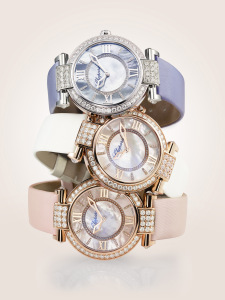 This new version of the Imperiale watch, a line born in 1990 and completely redesigned in 2010, is being launched in three of Chopard’s favourite colours: timeless white, as well as two subtle pastels. Lavender blue and powder pink are two rich, delicately patinated colours that also bear the mark of History and elegance, while infusing the timeless lines of the Imperiale watch with a new touch of sensuality. Crafted in rose gold for versions with a pink and white mother-of-pearl dial, and white gold for the blue version, the Imperiale watch also comes with a range of satin straps matching the dial colours. The bezel, lugs and hour-markers are set with brilliant-cut diamonds, resulting in a model whose elegance is rooted in History and entirely in tune with modern times. The dial is of a shimmering mother-of-pearl, which gives the watch unprecedented luminosity. The Imperiale watch is truly reminiscent of the Imperial era, in its lines, proportions and subtle details: roman numerals, the hands like sharp daggers used by sovereigns in battle, the crown curved like a lotus flower, the shape of the lugs reflecting the traditions of antique columns. A contemporary, refined and sophisticated interpretation of bygone times. Post edited by Claudia Carletti, Jewellery Through Time. Material courtesy of Chopard Press Office.